Home > Aviation Batteries > BP-200XL: 9.6 volt 1450mAh LONG LIFE Ni-MH battery for ICOM IC-T8A, T81A, IC-A23, IC-A5 etc. BP-200XL: 9.6 volt 1450mAh LONG LIFE Ni-MH battery for ICOM IC-T8A, T81A, IC-A23, IC-A5 etc. BP-200XL (a.k.a. BP-200xh): 9.6 volt 1450mAh LONG LIFE rechargeable Ni-MH battery pack for ICOM radios. Fits IC-T8A, IC-T8H, IC-T81A, IC-T81E, IC-A23, IC-A5, etc (all worldwide versions). Replaces original BP-200L. The BP-200XL re-charges thru the radio (with Wall Charger or DC Cable), or in the EMS-30i desktop rapid charger (sold separately). It can also be charged in the original ICOM-brand desktop charger if you use a spacer-adapter. The BP-200XL includes a heavy-duty spring-loaded belt clip. Battery casing is 3/4" thick. This battery replaces the original BP-199, BP-200, & BP-200L, and provides greater operating time than the original battery. Pricing is for 1 battery pack. Picture shows both sides of the battery. BP-197h: 6-cell AA Alkaline Battery Case for ICOM IC-T8A, IC-T8E, IC-T81A, IC-T81E, IC-A23, IC-A5, etc. Provides higher-Watt TX capability! CBE-200 : DC battery eliminator for ICOM IC-T8A, IC-T81A, IC-A23, IC-A5, etc. Plugs into 12-13.8VDC socket. CBE-200: Battery Eliminator for ICOM radios. Fits IC-T8A, IC-T8H, IC-T8E, IC-T81A, IC-T81E, IC-A23, IC-A5 radios, etc. 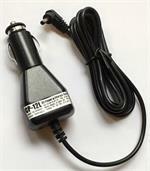 Plugs into 12-13.8VDC socket; has coiled cord; clips onto back of radio. EMS-30i : Desktop Rapid Charger for ICOM-style BP-200L, BP-200XL, etc. EMS-30i : Desktop Rapid Charger for ICOM-type battery packs such as BP-200, BP-200L, BP-200h, BP-200XL, & BP-200xh. Charges battery alone, or the entire handheld w/ battery can be inserted.